Team Quests is a new feature coming to weekly events in War Dragons where players can earn rewards for team cooperation and communal play. Quests reset daily and provide compelling activities to accomplish with your team, letting you and your teammates collect rotating rewards! Team Quests will be available starting this week with the upcoming King of the Hill event. See our handy Team Quests FAQ below for more information on the new event feature. Challenge yourself and earn tons of rewards with your team! Team Quests provides players with daily quests that feature fun and challenging activities to complete during both major and minor events. Every quest completed contributes to a team chest that gives a team continuously better rewards as the tasks increase in difficulty. 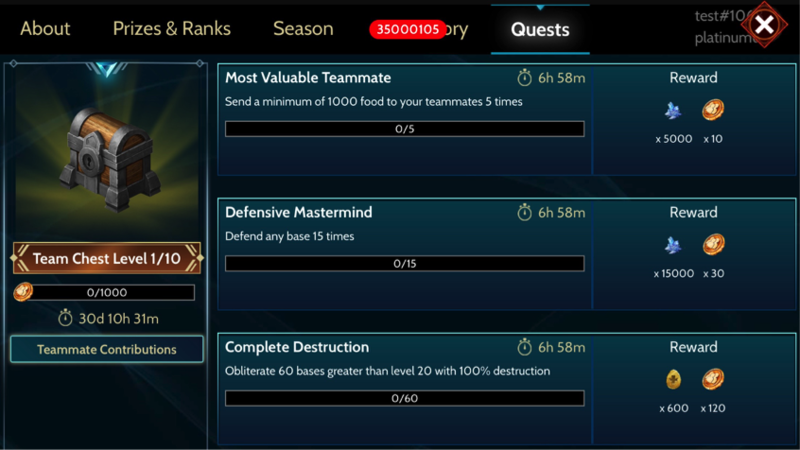 How do Team Quests work? Each day during an event, players will see three quests in the “Quests” tab that vary from easy to hard. There will be a total of 5 days of quests for each event, totaling to 15 team quests per week. Complete these quests to earn rewards for both yourself and your team! Do Team Quests and their rewards scale by level? Some quests scale by level, but others do not, based on the type of quest. We want these quests to be fun and challenging for players at every level and we will be adjusting the quests as necessary to meet this goal! What kinds of missions will be a part of Team Quests? There will be all kinds of quests available each day, including attacking other bases, joining attacks with fellow teammates, sending resources to fellow teammates, defending bases against enemies, and many more. What kinds of rewards will I be able to receive? Each quest comes with prizes that match the difficulty of the quest. This includes an individual reward and quest points that contribute to the team chest. Quest points contributed by the team level up the team chest so that it gives better rewards that are claimable at the end of an event every Monday. 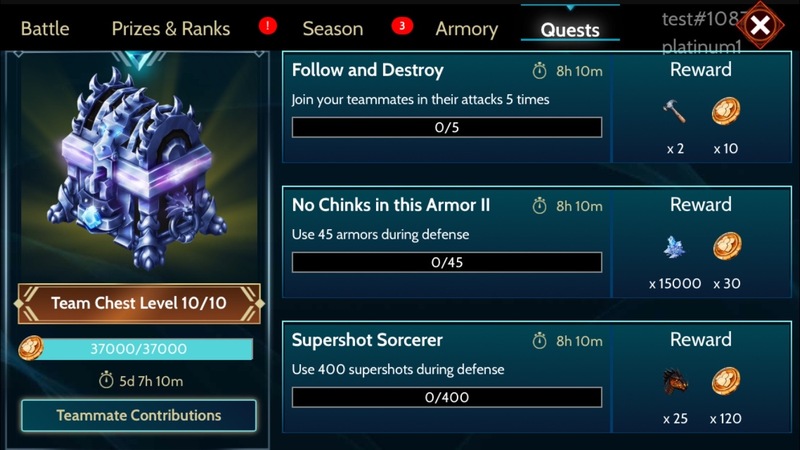 Note that you must contribute individual quest points in order to be eligible for the team chest. This is the first iteration of Team Quests, and we will be working in the next couple of weeks and months to improve upon the feature. This includes, but is not limited to, tweaking the quests, rewards, and team chest so that players will have the best experience possible.